When I left you yesterday, Dear Reader, I had completed the cake portion of Toasted Almond Layer Cake, from Paula Shoyer's new book The Kosher Baker. Let's head on now to the finish line! Next is the buttercream icing. Sugar and water are combined in a saucepan and heated. A candy thermometer is used to check when the syrup reaches the proper temperature. Meanwhile, beat some more eggs at medium speed. This cake seems to use more eggs than a Passover cake! When the syrup reaches the proper temperature, reduce speed to low, then carefully drizzle it in. After all the syrup is added, increase mixer speed and beat until egg mixture is cooled down. When mixture is cool, start adding margarine, a tablespoon or two at a time. If you were impatient and tried to add the margarine too early, the margarine will melt and pool. Not a good thing. As mentioned in a previous post, one of my job responsibilities at the local library is to order cookbooks. When they arrive, the Good People in Technical Services process the cookbooks (catalog and protective cover'em, among other chores) before the books are released to the public. One of those Good People noticed how the recipes in a particular cookbook looked particularly delicious, so I asked if I could "borrow" it before it was released to the public. She replied that if I make one of the cakes for her birthday, she would rush it through processing. When I saw that the book was The Kosher Baker, I said YES!!! before finding out which glorious item she had in mind. 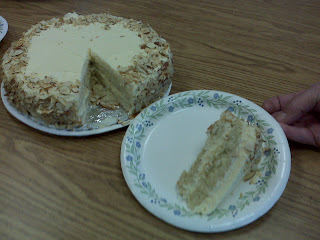 She opened the book and pointed to Toasted Almond Layer Cake. 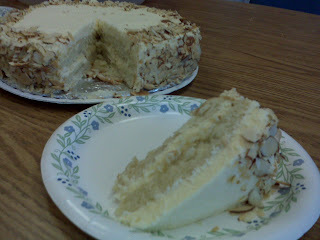 A triple-layer almond sponge cake, soaked in Amaretto syrup and slathered with almond buttercream. Thirteen steps, many of them with multi-parts.